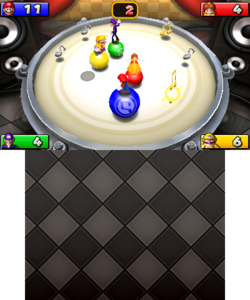 Musical Snares (known as Balance Beat in PAL regions) is a General minigame from Mario Party: Island Tour. The name is a pun on the party game "musical chairs". A note drops in the middle of the snare drum, and the game begins. Musical notes are popping in on the drum, and players, who are on rubber balls, scramble to collect them in order to earn points. Silver notes are worth one point, while golden notes are worth two. Every time the player gets a note, their ball will get bigger. The player with the highest score by the end of the minigame wins. Rules – NTSC "Collect as many musical notes as you can. Special gold notes are worth extra points." Rules – PAL "Collect the musical notes that appear on the stage." This page was last edited on May 23, 2018, at 05:37.